Rocket City Roofers – 5 Star Roofing and Restoration is proud to serve Huntsville and the surrounding areas. We’ve been in business for over 40 years which had us serving alabama homeowners and businesses during the Apollo era. Since then, we’ve grown across the state of Alabama from Mobile to Huntsville with four office locations positioned to better serve our home state. If you’re anywhere in Madison County, we’d love to stop by for a free inspection. Whether it’s hail damage or a meteorite strike, we’ll be glad to assess the damage and work with your insurance company so you have very little out-of-pocket costs to repair or replace your roof. Call us, Huntsville! We’ll be there in less time than it takes to reach orbit. Every roof has a lifecycle. Even slate and copper eventually need to be replaced as time and weather ages the materials. Asphalt shingles typically have a 20-30 year lifespan, even in the best weather conditions. Severe winds, hail, and time work together to deteriorate even the best materials. Many times homeowners aren’t even aware of major signs of damage because they can be difficult to spot from the ground. That’s why our trained crews are offering no-cost professional inspections throughout Madison County. We can identify both the cause and extent of damage. We’ll give you an honest and fair assessment of your options so you can make the right decision to protect your property from further damage. “But isn’t a full roof replacement expensive?” The best answer is, it doesn’t have to be. If we identify the need for a full replacement, we immediately begin working on your behalf to file a claim with your homeowners insurance. It’s not uncommon for homeowners in Huntsville to only pay a modest deductible for a brand new roof. Once the claim is filed, it gets sent to your mortgage company for approval as well. Typically, the value of your home will increase significantly, which is why your mortgage lender wants know about the replacement. After they have both signed off on the work, the homeowner usually receives a check which covers everything but the deductible in most cases. While we’re busy working through all that paperwork for you in the office, our crews are busy sourcing materials, removing the old roof, and replacing it with durable materials from top manufacturers like GAF and IKO. We’re factory certified by both companies, so you can trust our quality of work and professionalism. There’s no need to fear a roof replacement, and delays could cause the damage to spread into your decking and rafters. It’s best to schedule an inspection immediately and avoid delays. If you suspect any of these issues, or if it’s been more than a year since your roof was professionally inspected, give us a call. But how do I notice roof damage? 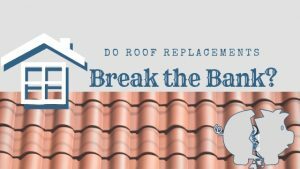 There are cases where the average homeowner can spot obvious signs of roof damage, but it is important to note once more that even a small amount of moisture can lead to massive damage. If any of these conditions apply to you, reach out for a free inspection today. Businesses and contractors all over the Huntsville area rely on their roof to keep employees and customers safe from the elements. Modern flat roofs provide extreme durability and low cost solutions or commercial spaces. In spite of modern advances in materials, these structures do require replacement from time-to-time. If you own a historic building or some other unique commercial structure, we are also experts at copper, slate, and wood shake roofs. 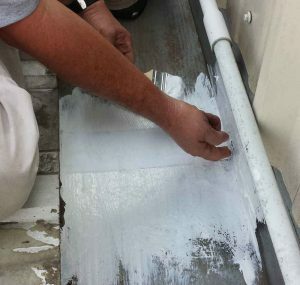 Our commercial work is fully bonded, and we offer a no-leak guarantee. Modern commercial roofing materials are durable and rugged. However, all things manmade wear out in time, and a flat roof system is no exception to that rule. That’s why we offer repair, maintenance, restoration, retrofits, and even full replacements of commercial and industrial roofs. As a property manager or business owner, you understand the value of working with a local contractor you can hold accountable. Our commercial roof repair crews work with building owners and maintenance supervisors to find and document any signs of roof damage. From there, we’ll provide an honest and accurate assessment of the work needed. We probably will not be the lowest bid but when quality matters, protect your investment with our no leak guarantee. Storm damage can occur when high winds cause shingles to tear, blow off, or curl up. In any of those cases, the underlayment and decking get exposed to water damage. Hailstorms can also damage roofs with dents that might seem harmless or barely visible to the untrained eye. However, hail damaged shingles are missing some of the material that helps keep rainwater from reaching the structural materials below. If you even suspect hail damage from a recent storm, hire a L-O-C-A-L contractor to inspect for damage. It’s an unfortunate fact that this industry is full of so-called ‘storm chasers’ who will often descend on an area looking to make a fast profit. Homeowners sometimes fall victim to this practice. When the work isn’t done properly it can lead to what should be warranty work, the out-of-State contractor is either long gone or completely out of business. That’s why it is always important to hire a trusted local contractor for storm damage work. You want to be able to hold the roofer accountable for any issues you might experience later on down the road. At 5 Star Roofing and Restoration, we offer a no leak guarantee on both residential and commercial work. We’ve been roofing in Alabama for over 40 years, and we come highly rated by the BBB. Give us a call if you suspect damage from hail or high winds. Restoration roofing is actually a fairly cost effective option to extend the life of an existing structure. Built-up roofs, modified bitumen, or single-ply materials are prime candidates for a restoration job.